I see that you are having problems connecting to the internet, is that correct? 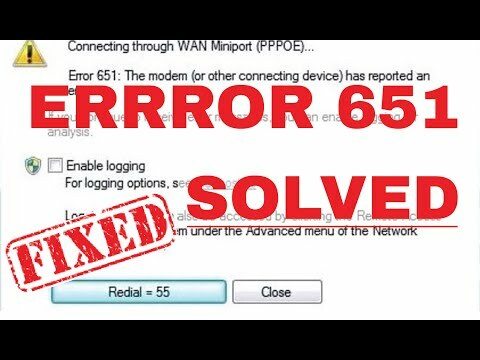 Error 651 is normally an authentication error with your internet connection. This could be due to an incorrect password. I did find this thread that deals with the error. There are troubleshooting steps included. Follow the troubleshooting steps and let me know what happens. You may have to contact your internet service provider for assistance. Hi There, It is not actually authentication. This is common error on windos 8 and rarely on windows 7. i had same issue and got solution from below post. it worked for me. Hope this works for you as well. I have Windows 7 and I have the Error 651. I don't think it's that "rare". It just suddenly appeared out of nowhere. It is showing my home network as a "puclic network" and I don't think I set it up that way. Do you have any recommendations on this error? I had error 651 shortly after our cable company switched our modem. They could not find the issue over the phone, so I kept playing around with it. I went through the windows diagnostic tool and refused when it told me to plut into ethernet. I am trying to solve this error from last week. at last I found here a best solution of error 651. I suggest you to solve error 651 by given way on that. It has a best information step by step, clean and with accurate solution. Even if you don't have understanding it gives you a video that can dive deep to solve this error. Not only me but my other friends who face this error are also solved by given way in that site. It is Really awesome and helpful for me. Thanks dude for the reference, I'm facing the same issue and will try that solution. Will update here if that work.